What in the world is going on in Terminator Genisys? A script leak — therefore plenty unreliable, so grains of salt and all that — has revealed a pile of possible plot details. If they're true, this movie is going to be completely banana pants. Possible spoilers ahead. Among other, smaller things — a reference by name to the iPhone and a deliberate decision to make this film more comedic (please, let the title be one of the jokes) — the major script leaks detailed by What Culture deal with John Connor and the major robot antagonists. Despite the focus of the trailers, rumors have it that the T-1000 played by Byung-hun Lee will team up with a T-850 to chase Kyle Reese and Sarah Connor. 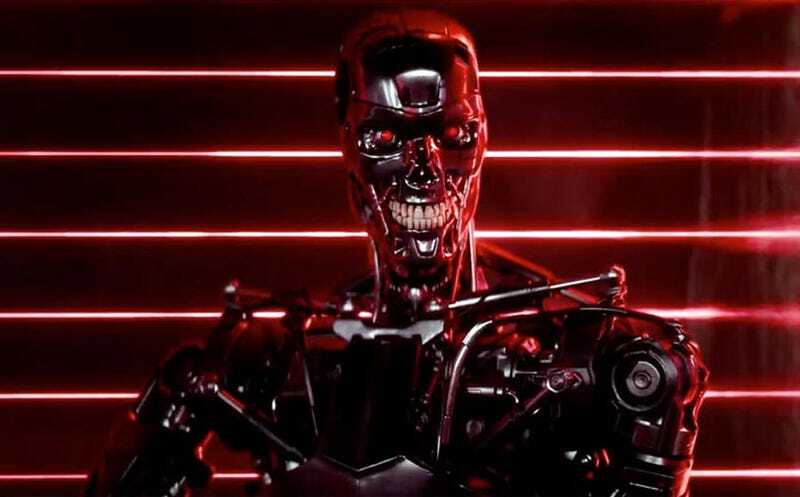 Not that it matters too much, because the same leak suggests that the young T-800, the T-1000, and the T-850 all get taken out of the picture in the first half of the film. I'd kind of believe this only because then the trailers are taking most of the footage from the beginning of the film, which does save the twists for the theaters. I don't believe it because, really, they're going to take out the major bad robots that early? And none of that compares to what's being said about John Connor in this film's timeline. One of the rumors is that we'll meet the T-5000 in Genysis, a Terminator made of nanorobots, which it can use to brainwash humans. John Connor gets whammied with these early in the film, infected with a nano "virus." Turning him into the movie's big bad villain. Yep. Grains of salt. He joins everyone in 2017, only now he's working to keep Skynet alive and well and trying to kill his mother and Kyle. And then evil John is blown up, along with Cyberdyne headquarters, by the T-800. That's... a radical approach to take with the character that we've spent all the other movies being told and shown is basically the savior of mankind. I mean, if the film wants to reset itself and make clear how different the timeline is right out of the gate, this is one way to do it. We'll see how accurate this script is to the actual film. The rumors also claim that Genisys is taking itself even less seriously than Terminator 3, which I don't think the trailer bears out as a direction. (Although, Ken Doll Arnold kind of does.) So, for now, enjoy imagining that this film is going to be much more surprising than expected.